Do you want or need new kitchen cabinets? I share my opinions on sourcing the best quality kitchen cabinets for the money. Reconsider the need for new kitchen cabinets at all. If you have an older house with its original kitchen cabinets, those old cabinets may be of better quality than any “affordable” new cabinets available today. If your existing kitchen cabinets are sturdy and still serviceable, there are numerous ways to give them new life. This would help you avoid significant, unnecessary spending, not to mention the stress of a major renovation. Can you work with your cabinets? Refinish them if the wood is nice… Or repaint them… If the doors and drawers have decorative moldings and you want to go for a glazed look, try a solution like Rust-oleum Cabinet Transformations… Then, swap out the cabinet hardware for a fresh new/old look. Other ideas: Add glass-front doors to some of the wall cabinets, or take some doors off some of the wall cabinets for an open look. Remember, Reality Check: You typically do not make your money back on remodeling projects — plan your spending with care. Shop for vintage steel kitchen cabinets. This is the route I took. The 1975 melamine cabinets in my 1951 kitchen were literally falling apart. I learned about vintage steel kitchen cabinets and went on a five-year hunt. I finally found my 1963 aquamarine Genevas, original finish, in great shape in a cooking school formerly run by nuns. I bought 67 cabinets for $3,000. I installed a bunch of them and then sold the leftovers on ebay for $2,500. And did you catch that: My cabinets are STEEL. Like Superman. With steel roll-out shelves. These cabinets will outlive me. Heck, barring a flood, they will live FOREVER. Want to learn more about vintage steel kitchen cabinets? I have dozens of stories about vintage steel kitchen cabinets here on the blog. We also have a Forum focused on buying/selling steel cabinets — we’ve identified more than 75 vintage brands. Youngstown steel cabinets were the biggest-selling brand, so will be the most plentiful today. 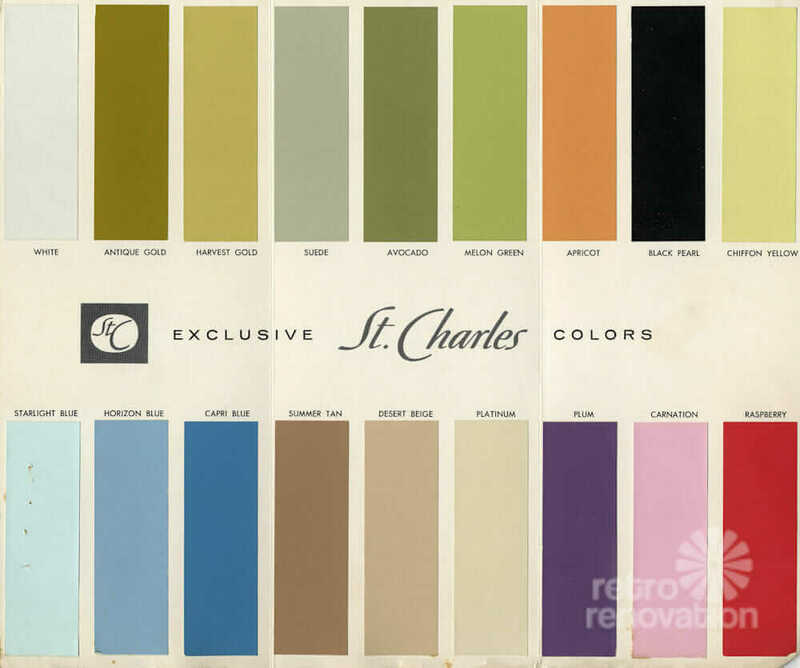 But St. Charles steel cabinets (shown in the photo above, 1941) are the best-of-the-best. The St. Charles’ were made of even heavier steel than my Genevas. They are something. Still, many of the other brands are wonderful — and will do the trick just fine. Searching out steel kitchen cabinets can be a chore. And then, you may need to have them repainted at additional expense. But dollar-for-dollar, I can’t imagine finding any better quality kitchen cabinets for your money, especially for a mid century house or any house with a kitchen being done with vintage flair. For new wood cabinets, read the research on Consumer Reports. I am a ginormous fan of Consumer Reports. All of their testing is independent. They are not beholden to advertisers. They exist to serve their subscribers. Whenever I am in the buying mode for big stuff, I buy an online subscription, so I can research like a maniac. It makes my decision-making process so much easier. Right now, they do not show any brand-by-brand tests of kitchen cabinets. But they do have an article about what kind of construction to look for if you are looking for new wood kitchen cabinets. So read up. Note, though, that their #1 recommendation is same as mine: Can you work with the cabinets you have? Readers, what is the situation with your kitchen cabinets? Do you have experience to share with others? Our 60’s kitchen cabinets had already been repainted, so I was not about to strip them. It was still a lot of work to take all the doors down, patch, prime, and repaint them white. We had a contractor replace the hinges. Even with a small kitchen, the job took a couple of weeks. We then got new counters, backsplash, sink, faucet, and hardware. Our knotty pine paneling had also been repainted, so we also have them a creamier white than the cabinets. I think a lot of people would’ve just gotten rid of the cabinets and installed budget cabinets, but these cabinets had been here nearly 50 years and were sturdy. Full custom cabinets would not be typical in our moderate housing neighborhood, but Ikea might work well. For the additional storage we needed, we found a vintage stereo cabinet we repurposed as a bar, and we have a huge Heywood-Wakefield domed-glass hutch which holds barware and linens. 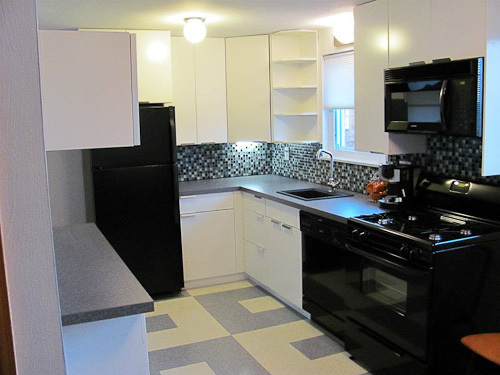 Before making any rushed decisions live with your cabinets for awhile. I don’t particularly love my kitchen cabinets but there’s nothing technically wrong with them and they’ve grown on me. First things first, clean them! If they are wood, using a nice orange oil can really make some dull cabinets shine. This definitely helped me appreciate my cabinets more. So maybe they are the wrong color… It’s time to get messy ( or hire someone to get messy) and refinish the surface with a new stain or paint. Or maybe you’ve got my problem and you just don’t like the style of cabinet, you can always just replace the doors. My doors are beveled and I’d rather the flat modern look. Still, replacing 50 cabinet doors can be very pricey (which is why I haven’t done it). But this works when the layout of your cabinets works but the facade needs an overhaul. Sometimes just changing the hardware makes enough of a difference. The point is, kitchen cabinet replacement or makeovers can get very expensive so take your time and think it over. Also when it comes to steel cabinets it can be hard to leave them original or have them refinished. My parents just bought a new home with a huge 1953 st charles kitchen. They were white and the while room was decorated black and white. For most readers of the blog they’d be in heaven but some regular folk would have been turned off by its sterility. The original finish had become dull and worn down to the primer around some of the handles. I spoke with my parents about the cabinets and we agreed that if we didn’t refinish them, the next owners of this house will probably rip them out and start over. We had a auto paint and body friend repaint them aqua and they shine and look just like a mint condition classic car. Everyone (including the previous owners) has been floored! They just love it. Now I see them being used and appreciated another 60 years! Wow, they sound spiffy! 🙂 I always drool over the classic cars I see around here with the pretty colors of aqua, minty green, buttery yellow, etc. Also you should consider upgrading the guts of the cabinets if your cabinets look good but aren’t working well. I have great solid oak custom cabinets, but the drawer hardware was worn out, making the drawers heavy to pull and squeaky, especially the drawers that had been used the most over the years or filled with heavy silverware. We had new drawers made and installed, and the existing drawer fronts were reattached to these new drawers. It has made a tremendous difference in how the kitchen feels. I have wonderful, smooth, whisper close glides and full extension drawers, which effectively doubled the amount of usable space in my drawers. It wasn’t cheap, as it was all custom work, but my cabinets FEEL brand new! I also imagine that some people could really benefit from having awkward fixed shelves removed and adjustable shelves installed or pull out shelves installed. My 1951 kitchen has the original, built on sight, kitchen cabinets. They have been sloppily painted many times without ever having the hardware removed. They are not deep enough, and the fixed shelves are so close together I cannot even stand up a bottle of oil or a cereal box. In addition, there are not enough of them. And at 4’10” tall, I cannot even reach the middle shelves of the uppers. That being said, we cannot bring ourselves to fork out hard earned cash on a gut job (or even a modest update) when mid century homes in my neighborhood are selling for less than $60,000! Our home is now worth much less than when we purchased it in 2010. We would NEVER get the return on the money if we remodeled 🙁 We are stuck and making due with what we have. Why do people paint hinges? Are they really too lazy to take the doors, if they are going to the trouble of re-painting the cabinets. That drives me batty. Are these the same folks that paint over switch plate and outlet covers? IF someone needs new cabinets, I would strongly encourage folks not to discount a local craftsperson. We kept the original cabinets in our kitchen, but had additional cabinets built to match the originals, giving us much needed extra storage and food prep area. An independent woodworker can often do MUCH higher-quality work for considerably less than a “specialty” kitchen company or even a big-box store. What’s more, it keeps dollars local and most likely keeps someone in your community working. Yes, there are more! Click here to get to the stories in our Vintage Steel Kitchen Cabinets Category.